Anybody ever read that book, "My Petition for More Space"? This is how I was feeling as I methodically planned for a larger garden area. 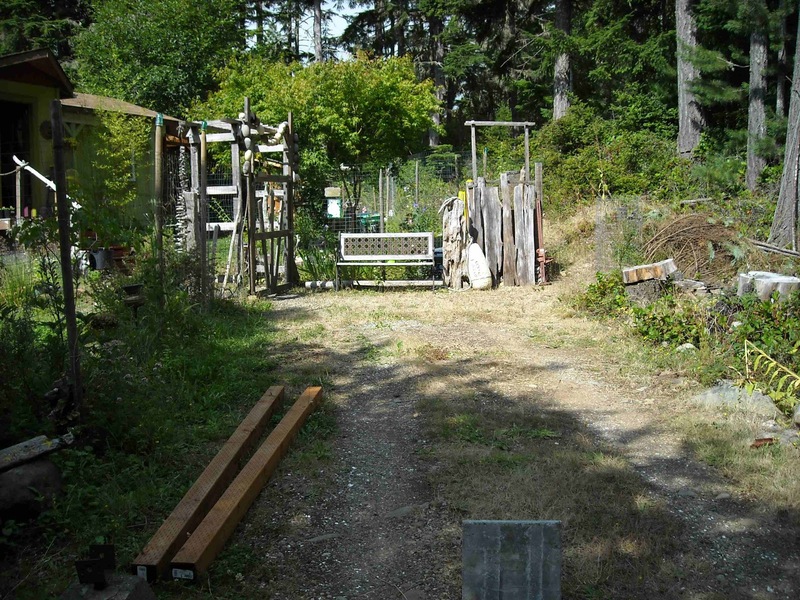 So I expanded the fenced yard in an effort to increase the food production for next year. I give you ~ the new entrance! Basically this is the same funky structure I was using before, but now adorned with the bamboo. Behind this area is the new garden space, previously the parking space. I opted to walk farther to the house in order to grow more food! In the beginning it looked like this. The next step was to set the boundary and put in some posts. After removing the old fencing and moving it in to the new space I was quite pleased with the added space! Here's a view from the house (below). Of course there is much work to be done between now and next years growing season. 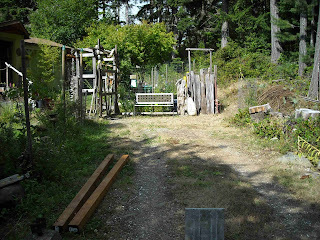 I will install raised beds and possibly a small greenhouse. That border bed of flowers will be moved to open up the space. So, once again, here is the main entrance. This looks just gorgeous, Jeni! Way to go! A greenhouse? What a brilliant idea. How nice it would be to grow (and eat) some food year round. Can't wait to see more updates!